Dengue fever was spread by the Aedes aegypti mosquito and is caused by one of four dengue viruses. Once you are infected with any one of the dengue virus, you will develop immunity to that virus for the rest of your life. However, this immunity will not protect you from the other viruses. It is possible to be infected with all four different types of the dengue virus in your lifetime. 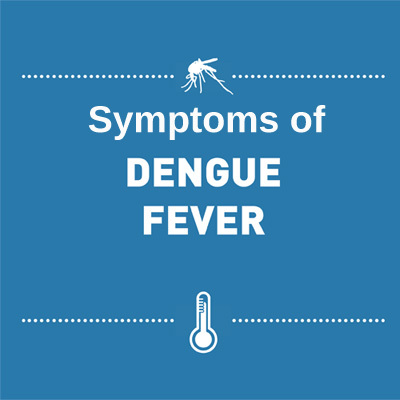 Fever and painful muscle, bone, and joint aches are the main Dengue fever symptoms. If the disease was not treated quickly, it may cause death. Since dengue is a mosquito-borne infection that causes a severe flu-like illness, people of all ages who are exposed to infected mosquitoes can get Dengue Fever. The disease occurs most often during the rainy season in areas with high numbers of infected mosquitoes. Typically, people infected with dengue fever virus are asymptomatic (80%) or have only mild symptoms such as an uncomplicated fever. The patient usually suffers from fever for the initial 3 to 4 days, followed by body pain. Retro-orbital pain i.e., pain behind the eyes is also quite common. In acute cases, decreased urine output, respiratory difficulties, and increased bleeding tendencies also accompany the usual dengue fever symptoms. The classic dengue fever lasts about six to seven days, with a smaller peak of fever at the trailing end of the disease. Clinically, the platelet count also drops until the patient’s temperature is normal. Is Dengue Fever contagious? is the common question that comes to your mind. No, a person with Dengue Fever is not contagious. It can only be transmitted by the bite of an infected mosquito called Aedes Aegypti that is more active during the day. So, it can’t be spread directly from person to person. If any of your family members gets dengue fever, be careful about efforts to protect yourself and other family members from mosquitoes. Because the mosquitoes that bite the infected person could spread the infection to others in your home. During a mild case of dengu fever, many people, especially children and teens, may experience no signs or symptoms. Severe Eye pain (behind eyes). Most people recover within a week or 10 days. But in some cases, the dengue fever symptoms may worsen and become life-threatening. Also, the blood vessels become damaged and leaky. If you have observed any of the following warning signs and symptoms of Dengue, rush the patient immediately to an emergency room or the closest health care provider. Severe abdominal pain or persistent vomiting. Red spots or patches on the skin. Pale, cold, or humid skin. Bleeding from nose or gums. Black and tarry stools (feces, excrement). In younger children, Dengue generally starts as a viral fever with symptoms such as a runny nose, cough, and a mild rash on the skin. It is also referred as “breakbone fever” because of the symptoms it causes. Generally, dengue in children resolves on its own and there are no specific medicines to quickly treat dengue. If severe forms of dengue have been diagnosed, then hospitalization may be required. Your child may have a high fever up to 105.80C. Joint Aches and Pain behind eyes. A frequent headache and chills. Mild body rash or a red and white patchy rash. Kids may experience Flu-like conditions such as a cough and cold. Also, Dengue makes a person very pale and weak, and this weakness may continue for some time after the illness as well. It’s essential to watch for these signs, which may otherwise take the form of more complicated and life-threatening conditions such as Dengue Hemorrhagic Fever and Dengue shock syndrome. Babies under 12 months are more likely to develop a severe case of the disease. But the signs and symptoms of dengue in infants are almost similar. If you live in or are traveling to a place where the illness is common, you can protect your baby by avoiding mosquito bites. If you observe rashes on your baby’s skin and also fever, you should be on guard. Along with these two signs, if your child is also complaining of body pain, it is best to contact your physician. So that the treatment to your child can be offered as soon as possible. Also, the best way to protect your child is to get rid of the mosquitoes that spread the virus. As of know, Dengue is a disease caused by a virus transmitted to people by certain mosquitoes. Some people may develop a more severe illness called Dengue Hemorrhagic Fever (DHF), which can be fatal if not diagnosed and treated promptly. 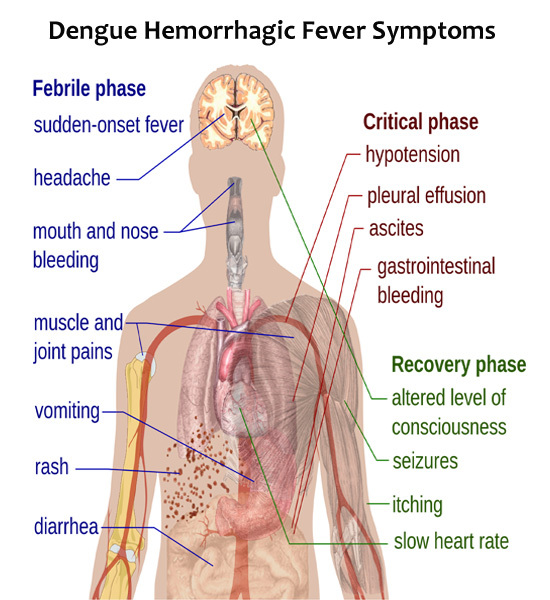 The Early symptoms of dengue hemorrhagic fever are similar to those that of dengue fever. But after several days the patient becomes restless, irritable, and sweaty. 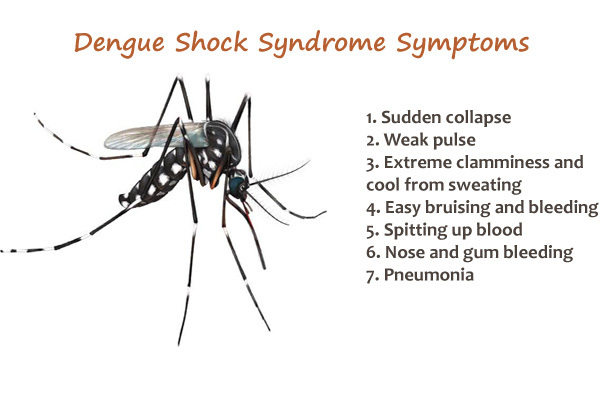 These First symptoms of Dengue are followed by a shock-like state which may also lead to death. Mild, Moderate or High Fever. Pain in joint or muscle or bones. Patches of blood under the skin. Tiny spots of blood on the skin. Cold, clammy arms, and legs. A significant decrease in blood pressure (shock). If you start experiencing any of the above symptoms, call your doctor immediately, and they will start your treatment. Also, the goal of the treatment is to manage the symptoms and keep the infection from becoming more severe. 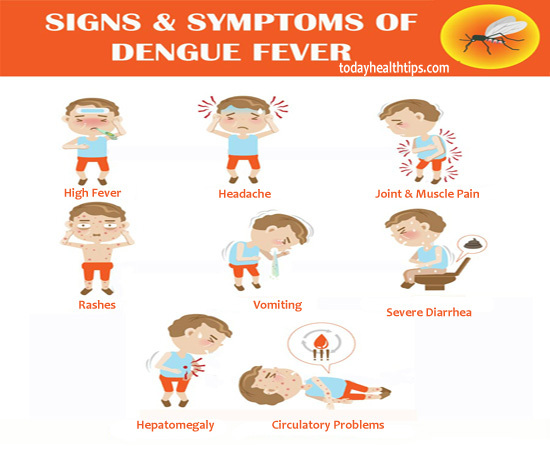 Dengue shock syndrome is the acute stage of dengue hemorrhagic fever in which the circulatory and other vital body systems of the patient reels in a shock-like state. The early symptoms of dengue shock syndrome are similar to dengue fever symptoms, but they worsen and culminate into a shocking state. The initial symptoms of dengue hemorrhagic fever include fever, headache, decreased appetite, vomiting, joint and muscle aches. 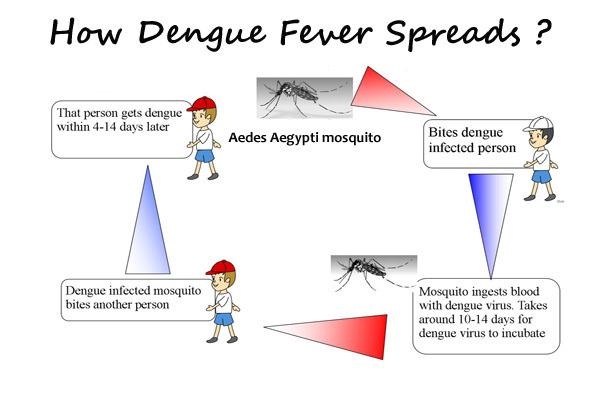 Dengue fever shock syndrome can occur after 2 to 6 days of infection. 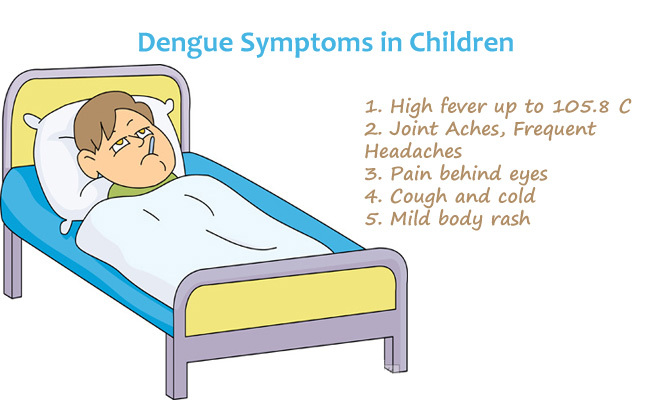 But these symptoms of dengue shock syndrome affects the children of age below 10 years much more severely than others. Extreme clamminess and cool from sweating. Spitting up blood due to Hematemesis condition. A condition of circumoral cyanosis that causes blueness around the mouth. Melena condition causing blood to come out in passing stool. Epistaxis condition (Nose and gum bleeding). Heart inflammation (myocarditis) and Pneumonia. So, these are the symptoms of Dengue fever. If you observe any of the above signs, immediately visit your doctor and seek treatment.